To say that Tim Geddes is an interesting character would be an understatement. With making wines from the old Maxwells winery (that is now owned by Scarpontoni) he has developed a number of wine making gigs as a contractor and just for fun he makes his own wine as well. The Seldom Inn label is a tribute to his father and reflects Tim’s sense of family. The Seldom Inn label started in 2003 with 1 or 2 barrels of wine to being a full time thing in 2007 with 800 cases of wine and progressing to 1800 cases of wine made in 2008. Tim exudes a bum down and get things done persona from the moment you meet him and his passion to produce a product that has his mark on it is also very evident. After tasting his 2008 reds and the 2009 whites I can use 1 word to describe his wine – Strength. There is nothing shy here, in it’s place is full flavored offerings that express a want to be different and to show what a winemaker can do. Tim has a web site for Tim Geddes Wines and you can contact Tim through this web site. Crisp and clean just describes this wine to a “T”. Passionfruit and melons with lots of acid length with an interesting finish with a hint of grape tannin. Good to see an everyday drinking white wine from McLaren Vale that is not Sauvignon Blanc. This is a wine to drink with friends on a hot summers Sunday. Wow, it this different or what. Tim wanted something more from his white wines, than just standard stainless steel non wooded white wines. 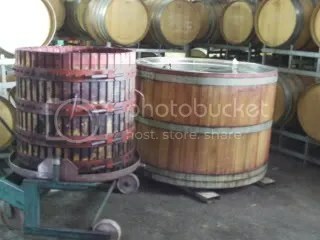 His winemakers want to “play” with some wine to make something different and with lots of character. Well he has succeeded. The use of native yeast, new french oak maturation for 10 months (on lees) has lead to another level compared to the Seldom Inn wine above. The aromas have passionfruit led tropical aromas with just a hint of creaminess. This creaminess just rolls into the palate that starts with creamy melons and has a wonderful mouthfeel texture from all this plus interesting layers of tannin. I expect this tannin is a combination of wood and grape tannins. In a word – “Funky”. There has only been about 20 dozen bottles produced but have not been labeled. The complexity here means this is a food wine and these flavors would match well with so many foods. The creaminess could go with rick cream based pasta dishes, or enough funkiness to match with coconut cream Thai curries. A Grenache (60%), Shiraz (30%) and Mataro (10%) blend that is one of my favorite styles at the moment. However, this wine would not be one of them – there is a tar and bitterness component here that spoils the red fruits and dry dusty tannins. After discussing this with Tim, I believe that the Grenache was over ripe and many of the bunches were heat damaged. The 15% alcohol is another indicator of the potential for over ripeness. Though not a bad wine, I would leave this one. As a note, I tasted the 2009 Grenache and it was wonderful (though not a finished wine) and I hope Tim makes a GSM and a straight Grenache from this base wine. This wine was certainly back on track. The fruit for this was mainly from 40 year old vines with this vintage picked early for McLaren Vale Cabernet that year and it missed most of the heat wave of that year. The best word for the aromas was “Black”. The flavors were just layers of black current fruit with just lovely tannin complexity that leaves the mouth screaming for more. This wine needs more time to reach it’s best but worth the wait it would be. Sit it aside for 5+ years and try it with Beef Wellington. Matured for 16 months in 40% new oak (both French & American) and the rest 1 year old oak. Big fruit here but with big oak and together it pulls the components together to make something better than each component would be on it’s own. Lots of dark plums, subtle spices and teeth coating dry tannins. Probably needs 10 years in the bottle, but I suspect little will make it that far. Such strength is this wine needs extremely strong flavored red meats. The surprise packet of the whole bunch from Tim this year. The aromas and palate just tasted like a quality quince paste with a good dose of tannins thrown in. As for the other reds here, it needs time to mature, however it is more approachable now than these other reds. I would try with with the sweetness of Hoisin Sauce based dishes. A barrel sample as the wine was not finished at time of tasting, but I was ready to drink this one now. The 13% new American oak was evident with the vanilla aromas and the fruit characters were just luscious. The best fruit with the different oak treatment has made a big difference – one to watch out for and the suggested $35 price tag is worth every cent. This entry was posted in Mclaren Vale, wine and tagged Cabernet Sauvignon, Grenache, Mclaren Vale, McLaren Vale Wine, Shiraz, Small Producer, wine, wine McLaren Vale. Bookmark the permalink.